Just to show I am actually doing something and not all talk because I realise for a week I think I’ve been saying how I’m drawing and then I show nothing so yeah, here’s a screen cap. 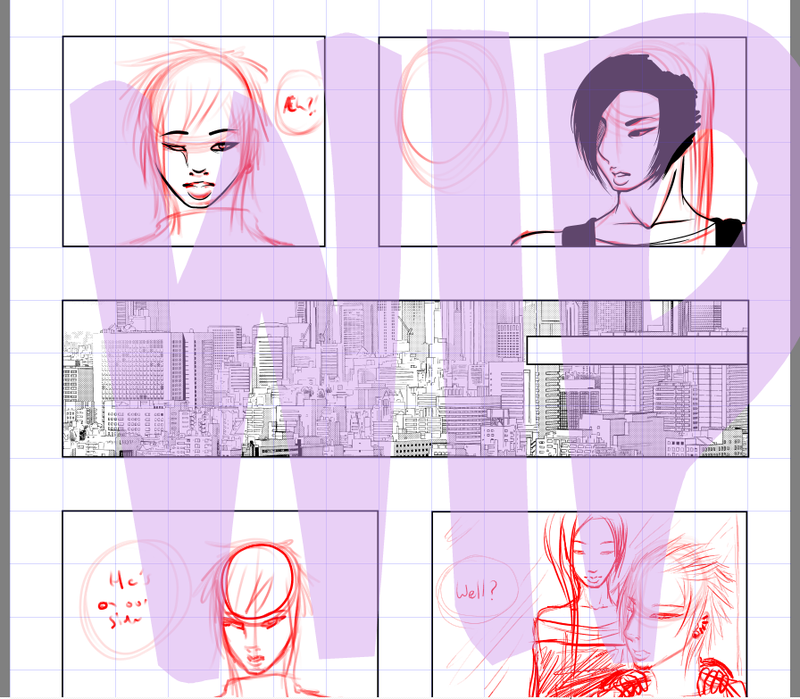 The city scape is a screentone so please don’t congratulate me on the city. I was playing with various tones, colouring them, toning them, adding shadows just to see the effects and to learn a bit more about stylizing buildings. Plus I want to keep this webcomic simple. The more simple the more likely I am to post regularly. I am considering posting to drunkduck.com because of what it offers now. I keep changing my mind lately but I will see what happens with the comic before I post elsewhere. This is just a random thing I thought to mention. Pencil tool isn’t really for sketching. It’s set to basic brushes for a reason. It’s more for making lines. If you hold shift while dragging up or down you get a perfect line but it you click then click a point in another direction all while holding down shift you get a diagonal line. If you do this with the pressure brushes even with a mouse you WON’T get a diagonal line, at least not one that’s very visible. I use to think that feature was excluded from photoshop elements until I actually found the pencil tool. I watch some youtube videos on drawing now and then and a lot of people seem to use the line shape instead of simple click+shift+drag or shift+click+click with the pencil tool. The disadvantage with the shape tool is rasterizing and merging all of those lines and cutting and pasting. If you go to window>> guide you can then see a ruler along the top and left side. Combine that with using shift instead and you can measure out your lines like you would with a real pen and ruler. This method also works with GIMP and a few other digital art programs. Just thought to mention here that I’m selling some photoshop brushes. All of them are good quality. Made in photoshop CS5. Should work in older versions to at least CS3. Not sure about any older versions though. Should work in photoshop elements. It has for mine. I use them and made them myself . All the brushes are previewed to the left. Most of which I used on the image to the right. 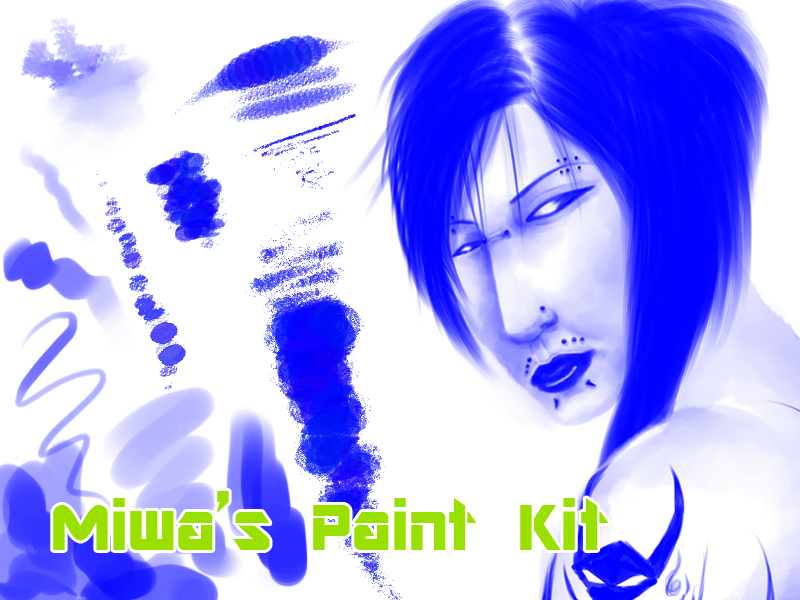 So basically this is my personal painting set with a few extras. The oily looking brushes do excellent blending when used with the smudge tool. It often gives a watered down effect. Suitable for realism and anime art. Suitable for making watercolour style art in photoshop. These brushes are NOT for re-sale. If you purchase these brushes you may use them in commerical works. 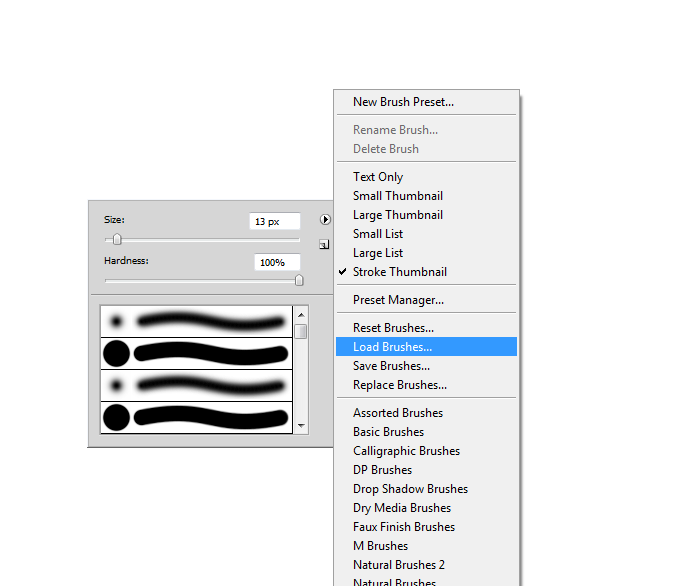 These brushes are intended for photoshop users looking for a paint-like effect. Open photoshop. Select brush tool. Right click page. This will open up the brush selection menu. The more options tab, click and select Load Brushes. Navigate to where you downloaded/saved the ABR file. You will then see it added onto your current brushes. I found this link that some may find helpful. It’s how to outline text in GIMP. The reason I am sharing this is because some of us don’t and can’t afford photoshop for that feature and if you make comic’s or manga, it’s something the becomes necessary when you need to put black text over a black background. Enjoy and happy drawing guys! Any questions, just comment and I’ll get back to you as soon as possible! Mostly random tips and very short in description. Quite possibly not helpful… hope not. But if you have questions or want a better explanation please ask in a comment. If you need a picture to go with it I will grab a screenshot no worries!! If you have scanned in your lineart please go to the gimp video link below and separate your line art to make it easier for you. If it’s to complicated for you, change the layer blending mode to Multiply and keep it at the top. Go to C: drive, Programs, find the folder Adobe, go to the version of photoshop you have, I have photoshop elements 7.0 so that’s the folder I go into. This plugin works in pse7. When you are in go to the folder labelled plugins open, go to filters folder, open and paste the plug-ins there. If you have photoshop open already, save your work, close, re-open and it will be working and located all the way down the bottom of the filters list. 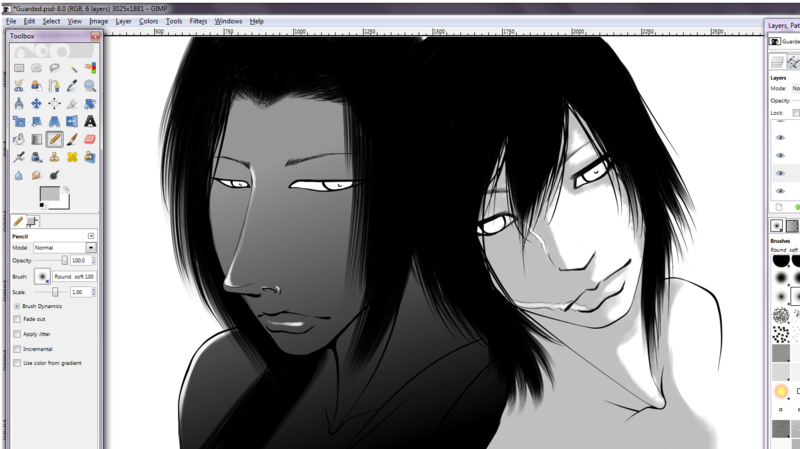 It’s VERY IMPORTANT TO CHANGE IMAGE TO GREYSCALE!! The tones will NOT work if you don’t change the image mode to greyscale!! Very sorry I have been away for so long but I’ve been working on things and have found an abandonded baby rat which I am taking care of and nursing. I’m a sucker for baby animals. 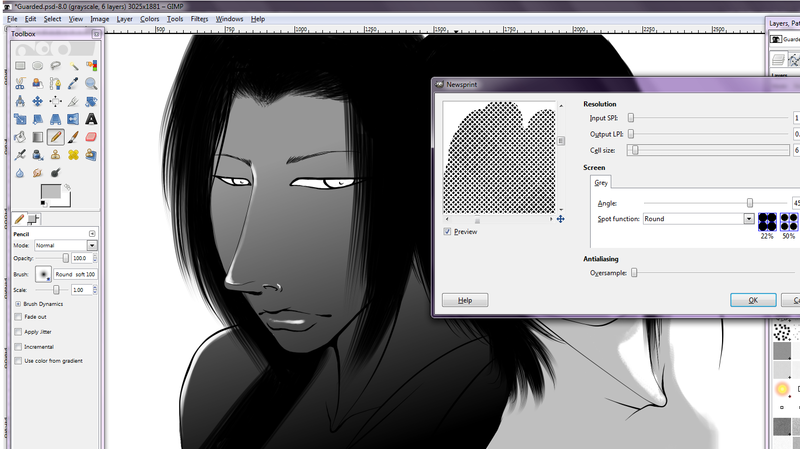 Anyway I thought that since CamStudio and windows movie maker hate me so much that I could screen cap how to screentone in gimp. 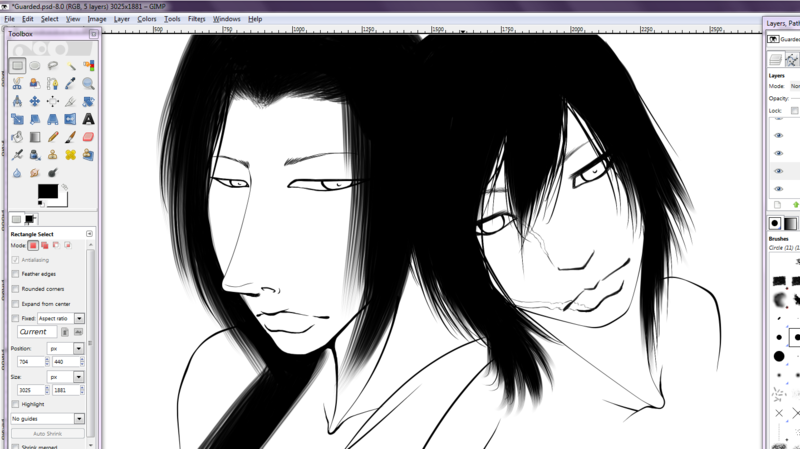 When you have finished and inked your work change the image mode to Greyscale. This step is very important! It’s so the tones will work properly later. The above image is one of my inked works. Next colour in grey tones in a layer underneath the lineart layer and label it tones. Colour where you’d liked shadows to be. Add patterns to it if you like or pattern stamp in the background. Keep it on the tone layer. If you have to use a sperate layer for some parts, remember to merge them at the end. Later if you want tones of differnt sizes just repeat the process on a new layer. It’s that simple. After you get use to it and judging the dot sizes, play around with the angel and dots to get other effects. When in a small view the tones will look distorted so be sure to check them with the image zoomed in at actual size or actual pixels. Also printing them out can often be the best test. You can do similar in photoshop. I’ll post a new post on how to do it in ps7. It’s almost the same process but slightly more complicated. 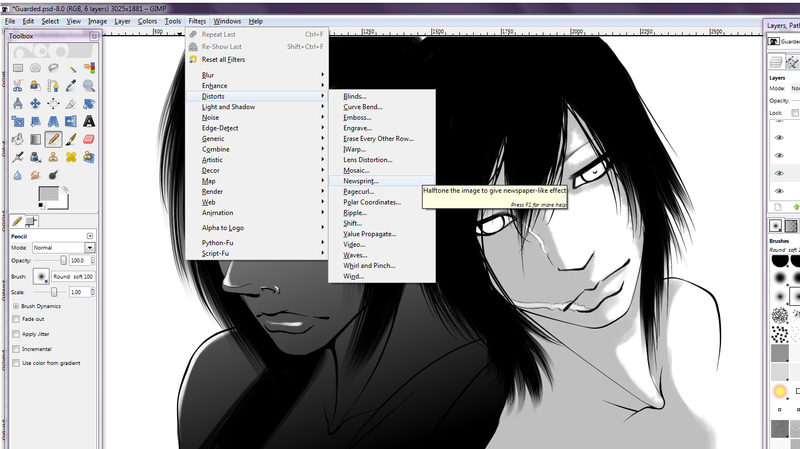 In GIMP it doesn’t seem to matter as much if you chose a paper size. The newsprint feature seems to be unaffected and works the same way in most resolutions. Photoshop on the other hand, if you choose to screentone in photoshop with the colour halftone feature then your image MUST be AT LEAST 300 resolution (or dpi). You can work from either 300, 600 or 1200 in any paper size eg A4, A5, A6, B4 etc. These are the main used resolutions or dpi for manga/comic’s and in order for colour halftone to work best you MUST have your image set to greyscale when you are ready to tone and you will find similar controls to what GIMP uses. 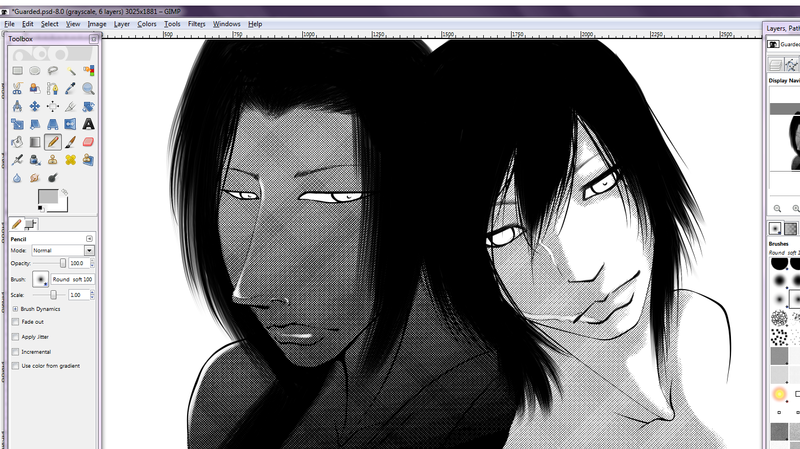 Halftone doesn’t work as well so you’ll have to use the colour halftone filter in greyscale mode for the best results. I’ve found paper size B4 set to a resolution of 600 works quite well. CLICK THIS LINK TO SEE A COLOUR HALF TONE SCREENTONED WORK DONE IN PHOTOSHOP. Next post I will give screen caps on how to do it along with a small repeat of the previous paragraph.